Richard Grossman is an economic historian at Wesleyan University and a recently announced winner of a 2013 Guggenheim Fellowship. He studies banking and banking regulation and is the author of the 2010 book "Unsettled Account" and the author of the forthcoming title, â€œWrong: Nine Economic Policy Disasters and What We Can Learn From Them" that will be published by Oxford University Press this October. Last Friday he got on the phone with Ideas to talk about his new book, his research plans for his time as a Guggenheim Fellow, and a host of current economic issues, from bank bailouts to Benjamin Bernanke to the future of the Euro. What follows is a transcript of that conversation, lightly edited for clarity. Ideas: You have a book coming out this October about economic policy disasters and what we can learn from them. Tell me about that. 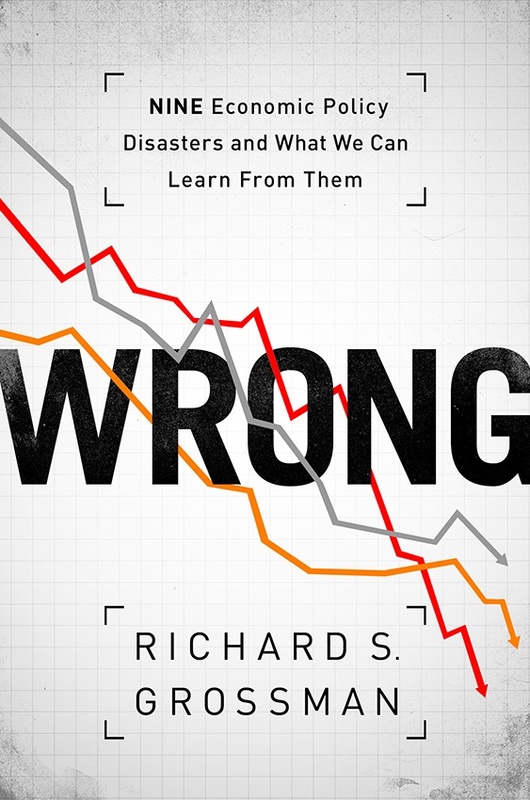 Richard Grossman: I found nine economic policy mistakes over the last couple hundred years and did a sort of economic autopsy to explain why they happened and find themes that runs through the mistakes. Ideas: What did you find? RG: The main theme seems to be that things go really wrong when policymakers are taken up by ideology. For example, if some percent of your political party sign a pledge saying they would never under any circumstances vote to raise taxes, I would say that is based purely on ideology. My book is sort of a plea for non-ideological, analysis-based economic policy. Ideas: How successfully do you think the Obama administration has pursued non-ideological economic policy? RG: Iâ€™m not in love with everything theyâ€™ve done but I would say they have been relatively non-ideological. Itâ€™s clear [with the Democrats] that there is no â€œwe will never do Xâ€� where X is some basic thing like raising taxes that governments have been doing for hundreds of years. Ideas: You have a positive view of Ben Bernankeâ€™s tenure as Chairman of the Federal Reserve. What do you like about what heâ€™s done? RG: A few things. One is transparency. If you had told me or any economist twenty years ago that the Chairman of the Federal Reserve was going to have a news conference four times a year to explain what theyâ€™ve done we would have said youâ€™re crazy. Before World War II most of the central banks in the world were technically private institutions and the guys running them really werenâ€™t accountable to anyone. Itâ€™s like glasnost, theyâ€™ve become more transparent. Itâ€™s not just that itâ€™s good for citizens, itâ€™s also good policymaking for the Fed to make clear what itâ€™s going to do. Ideas: Youâ€™ve written about how bankers in the past have responded to bailouts. After the collapse of Lehman Brothers there were worries that bailouts would end up abetting the same bad behavior in the future. What does history tell us about that? RG: I believe bailouts do encourage bad behavior but itâ€™s not just the bailouts themselves. Economics is all about incentives and when you line incentives up badly you get in trouble. It used to be in this country before the Great Depression that if you owned shares in a bank and the bank went out of business not only would you lose the shares, the bankruptcy court could come to you and make you pay an additional amount. Now they talk about this as â€œskin in the game,â€� which means the more the burden of excessive risk taking is placed on the people making the decisions, the more careful theyâ€™re going to be about making those decisions. The conclusion I draw from this is we have to be very careful about getting the incentives right. In the early 2000s, when we cut taxes three times in four years, when we increased spending on two wars, when we had really easy monetary policy, way easier than any of the standard models tell us we should have, and the regulation was being loosened, I think it was a recipe for disaster. The incentives [to take risks] were so strong. Ideas: Youâ€™ve also written about the financial problems in Europe. Some people are saying that the dissolution of the Euro is inevitable. Do you agree? RG: No. The Euro was a mistake but now that theyâ€™re in it there are too many incentives to maintain it. The Greeks donâ€™t want to get out because if they get out more money is going to flee the countryâ€”people estimate their GDP might fall by another quarter. And the Germans for sure donâ€™t want to get out because if they get out, itâ€™s going to be very difficult for them to find anyone to buy Mercedes-Benzes outside of Germany ever again. Ideas: Why would leaving the Euro kill German exports? RG: They would have to have a new currency. Suppose they reintroduce the German mark. The German mark would become extremely valuable, and when the value of your currency is very expensive it makes the price of your exports very expensive to people who buy them. Ideas: Looking ahead, what do you plan to do during your time as a Guggenheim Fellow? RG: One thing Iâ€™m interested in is, if a state had a particular regulation 50, 100, 150 years ago, does it affect the regulations that they have today? When California was set up, for example, it had no usury lawsâ€”you could lend money at whatever rate you wantedâ€”but if you were in Massachusetts there were very strict lending limits. The question is, can we look across states over time and see if there are things from when they began regulating that persist until today.